What's So Independent About All Things Independent At Emanuel's City Hall? 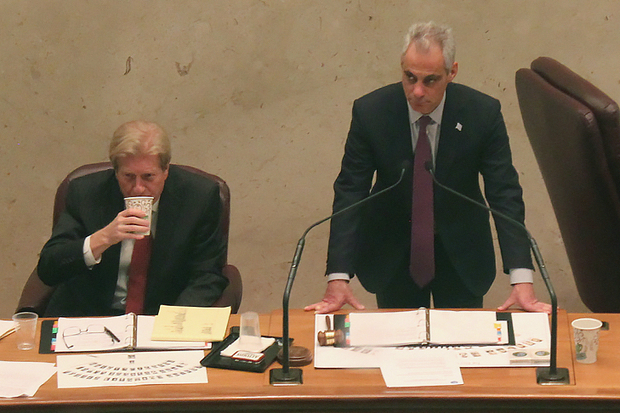 Mayor Rahm Emanuel and the city's Corporation Counsel Steve Patton listen to aldermen discuss policing issues issues during a December 2015 City Council meeting. CHICAGO — With federal investigators probing the police department, Mayor Rahm Emanuel’s administration has flipped on the deflector shields at City Hall in hopes the place doesn't suffer the same fate as the Death Star. The mayor’s spin machine on Sunday morning announced an “independent” review of how its Law Department defends federal civil rights lawsuits that accuse Chicago police officers of beating, brutalizing, framing, wrongfully imprisoning, shooting and/or killing people and things like that. Corporation counsel Steve Patton — not the mayor, who wasn’t mentioned in the spin machine announcement — tapped former U.S. Attorney Dan Webb, co-chairman of the powerful Winston & Strawn law firm, to lead the “independent” third-party review spurred by a federal judge’s ruling last week that a longtime city lawyer intentionally withheld evidence in a police shooting case. Chicagoans will have to wait to see what Webb and his team dig up when they delve deep into the methods city lawyers use to litigate civil rights lawsuits or cut deals to avoid them and keep evidence secret, as it happened in the police shooting that left 17-year-old Laquan McDonald dead. The way it was explained to me, though, City Hall hopes Webb’s investigation, which has no restrictions, leads to a report that reads something like a tip-sheet that will help city lawyers do a better job defending against civil rights lawsuits without, you know, cheating. And, well, if Webb discovers something hinky in the city’s legal methods, he’s free to report his findings to the city’s independent inspector general, who can recommend punishments but doesn’t have authority to independently discipline city employees or charge them with crimes. In the meantime, the whole review makes a guy wonder what’s so independent about anything labeled as independent at City Hall. Maybe in city government the word “independent” refers to something different than the dictionary definition: an adjective meaning free from control by others; not reliant on the support, especially financial support, of others; and not bound or committed to a political party. Take the Independent Police Review Authority, for instance. It’s led by a mayoral appointee with a budget approved by the 50-member City Council, which has only one Republican. Plus, emails have shown, the Emanuel administration is in near constant communication with the “independent” agency charged with investigating police misconduct. What’s so independent about that? It can’t be because Webb and his firm don’t have skin in the Chicago political game. Webb runs Winston & Strawn with co-chairman, former Gov. Jim Thompson, arguably one of the most powerful politicians in Illinois history not named Daley. Thompson and Richard J. Daley both have government buildings adjacent to City Hall named after them. It can’t be because Webb and his firm refuse to contribute to political campaigns. In an interview with the Tribune, Patton suggested that Webb’s ability to be independent speaks for itself. "He's not going to sully his reputation by not doing a good and thorough job, and I don't want him to,” Patton told the paper. After all, Webb was the prosecutor who brought about Operation Greylord, which leveled bribery and tax charges against more than 70 judges, lawyers, sheriff’s deputies and court clerks. 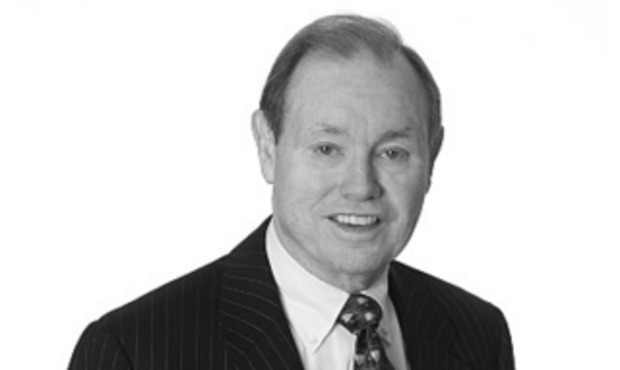 And most recently, acting as a special prosecutor, Webb helped secure involuntary manslaughter charges against former Mayor Daley’s nephew Richard Vanecko for throwing a punch that killed the late David Koschman when nobody else would. Furthermore, Patton told the Tribune, the city Law Department will benefit from Webb’s independent review because, “we're going to get a world-class trial lawyer reviewing how we do our work." And Patton would know about that. He and Webb both were part of a massive legal team that defended Philip Morris against a civil suit filed by the federal government. When I asked City Hall about that, a spokesman wanted to make something perfectly clear — Webb and Patton had totally separate roles on that case. Webb, who didn't respond to a message seeking comment, was a lead litigator on the case, according to court records. And it was Patton’s job, the spokesman said, to negotiate a settlement. So, let’s see if I’ve got this right. And now, working for Emanuel, they’re "independent" … together, again. Carry on U.S. Justice Department investigators, there's nothing to see here.